I received a free Moff Band to facilitate this review. All opinions are mine alone. Contains affiliate links. 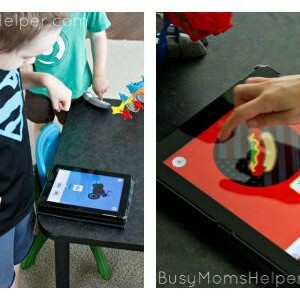 I’m definitely not the strictest mom when it comes to tablets, apps and my kids. I’m pretty cautious though – not only about how much time they spend on the devices, but also WHAT they’re doing on there. Whenever we think about adding another game or learning app, we read tons of reviews (if it doesn’t have many, we don’t download it), ask people if they know about it – and sometimes it STILL doesn’t pass. Our iPad only has about 5 games on it – and one is for this super fun Moff Band and Interactive App! I learned about the Moff Band at Blogger Bash this summer, and knew my kiddos would love it! It works via bluetooth with the free iOS app, allowing you to access a bunch of sound effects to play around with. You can even set the controls how you want, which wrist you prefer to have it on, along with a specific user profile. They then slap on the Moff Band, scroll through the dozens of sounds, pick one, then just move around and that sound plays! I love the variety they have – from hot dogs grilling, to fishing pole lines, to fireworks, motorcycles and even animals. Plus, they’re adding more all of the time! Once you’re in a specific sound – say, guitars – you can just hit the little button on the band to scroll through the varieties of that sound. Even my 4-year-old does this like a pro! …or yanking down on a train whistle! Another thing I love about this, other than it encourages MOVEMENT – not exactly common in apps – is that it brings my kids TOGETHER to play and use their imaginations as a group. This isn’t something that happens all that often with my kiddos – but I sure love seeing them gather around to help select new sounds, and decide how they’re going to play with that one. You can nab the Moff Band for just $54.99 on Amazon – and YES, it’s available with Amazon Prime!